Tool options configure the target hardware and the development environment. The options depend on the device and the toolchain selected. All settings are captured in a project target. You can define several project targets for different purposes, for example, one target for testing and another target for releasing the application. The toolbar button or the menu Project — Options for Target opens the dialog. 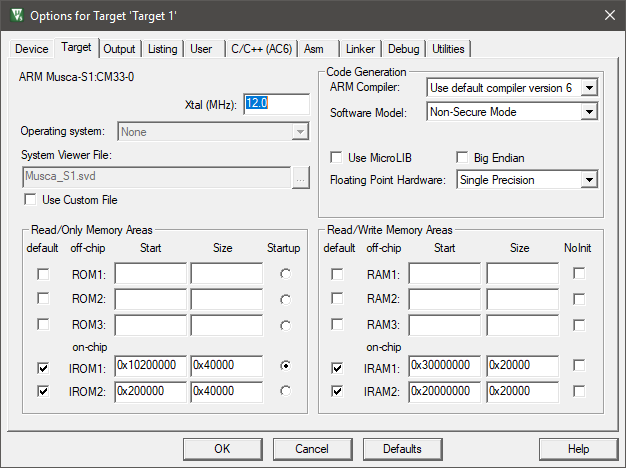 The Target dialog allows you to specify all relevant parameters for the target hardware and on-chip components. Refer to Target (MDK-ARM) for the field description. Refer to Options for a comprehensive list of configuration dialogs. You can set individual options for each project item. The options can differ from the settings defined for the parent item. Refer to File and Group Specific Options for details.